Whether it’s the proximity to family, the sense of community, or the beauty in the nature that surrounds them, residents are proud to call Dassel and Cokato their home. Roughly 50 miles from the Twin Cities, the two towns offer country living not far from the metropolitan area, offering recreational lakes, trails, and community events throughout the year. Roughly six miles separates the towns and they are connected by a regional trail that runs parallel to US Highway 12. Each town is unique in its own ways, but they can be considered one community, as they share a school district, among other things. Some of the qualities valued by its residents are the arts and cultural events provided by the historical societies, year-round entertainment at the Dassel-Cokato Performing Arts Center, and recreational opportunities that is made possible with the plethora of lakes within the area. Town ball is also a treasured pastime. During the spring and summer, residents are cheering on their favorite team, whether it’s the Dassel-Cokato Saints playing in the Dassel Ball Park or the Cokato Kings at Veterans Memorial Park. The Cokato Corn Carnival in August and Dassel Red Rooster Days over Labor Day weekend are annual events that bring the community together for food, fun, and entertainment. 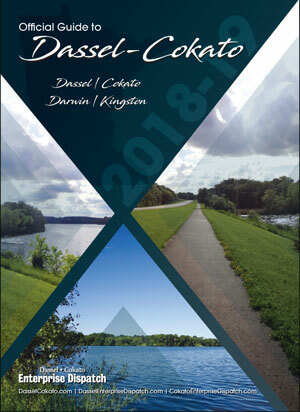 To find plenty of other reasons residents choose to call Dassel-Cokato home, look inside the 2016 Dassel-Cokato Community Guidebook, brought to you by the hometown newspaper, the Enterprise Dispatch. COMING SOON – ANOTHER CHANCE TO SAVE ON WINSTOCK ’19 TICKETS! Copyright © 2019 Dassel, MN. All rights reserved.